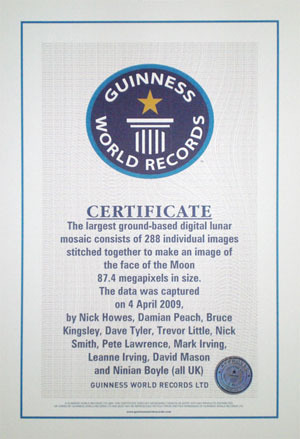 The image we have created is officially 'The Largest Ground-Based Digital Lunar Mosaic' (as of June 2009). This will be included in the Guinness World Records 2010 Book. On July 11th 2009, the team were presented with a certificate by Guinness World Records to officially recognise the achievement. 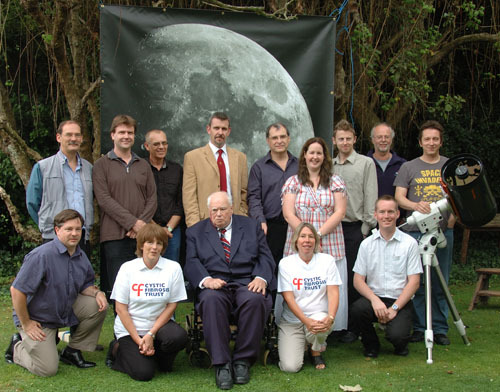 We met at Sir Patrick Moore's Selsey home, along with representatives from the Cystic Fibrosis Trust and members of the press. The full-size printed image, at 2.5 metres high and 2 metres across, was unveiled - this was the first time that the team themselves had seen it in print. After group photos, Nick Howes accepted the certificate from David Hawksett and Craig Glenday of Guinness World Records on behalf of the team. The image is 87.4 megapixels, with a Moon diameter of around 9550 pixels. That's an angular resolution of approximately 0.2 arcseconds per pixel, which allows features as small as 1km (0.6 miles) to be seen. The image is composed of 288 individual mosaic panes, painstakingly stitched and colour balanced by the team. The image was made on a single night to ensure that the Moon's phase is consistent across the image. With a longer timescale, shadows would move as the Moon rotates relative to the Sun, and lunar libration changes our view of the surface. The Guinness World Records logo is a trademark, used with permission.